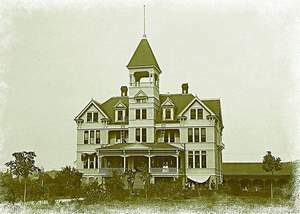 Forty years before the VA hospital was constructed, the property was the site of the Oregon State Soldiers’ Home. 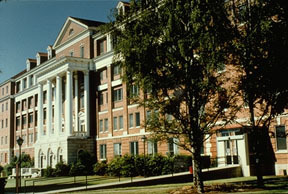 The Soldiers’ Home was created in 1893 by a legislative act, in order to provide housing for honorably discharged soldiers who served in any U.S.-engaged war. It was also available to those who served in the Indian Wars of Oregon, Washington or Idaho, as long as they were, or might become, U.S. citizens. A Board of Trustees went to work to implement the legislative order. Forty acres of riverside land located one mile from Roseburg was purchased — at $75 per acre — for the site. Today, the land is home to the Roseburg National Cemetery and the Umpqua Valley Arts Center. The soldiers’ home cost $7,483 to build, and heating, ventilating and plumbing cost an additional $3,200. Small fruit and berry patches were planted, and vegetable garden plots were created in order to make the home as self-sustaining as possible. The building was officially dedicated May 18, 1894. Originally, the home’s capacity was set at 54 veterans, but applications for admittance flooded the trustees and, over time, the facility was expanded and housed nearly 200 vets. In 39 years of operation, the Oregon State Soldiers’ Home cared for 2,000 veterans at a cost of slightly more than $1 million. From 1929 to 1931, Roseburg became the center of political activity regarding care for veterans. A two-year push to obtain a national soldiers’ home in Roseburg was successful, and on Sept. 18, 1931, the city was officially named the future site of a Veterans Administration Facility, according to a booklet created by the VA in 1983.